Immunization is one of the most effective ways of saving young lives, yet every year one in five children born—22 million—is left without this basic protection from disease. Why? It’s because existing vaccines are hard to use in the places where many of these children live. The problem with the vaccines currently available—both basic and newer vaccines—is that they have been developed for use in wealthy countries, with strong health systems, good transport and other functioning infrastructure. In trying to use these vaccines in countries which don’t have the advantages of good roads, reliable power supplies, and adequate numbers of trained staff, it becomes clear why so many children in developing countries fall through the immunization net. Most vaccines are administered in a number of separate doses to offer full protection. But for different vaccines, the timetables for when subsequent doses must be administered are different. This complex vaccination schedule creates a situation where children need to visit a clinic at least five times in their first year of life to ensure full immunization. This is often unrealistic for parents and other caregivers, who may be unable to travel with their children so frequently, especially if the clinic is far away. And that means children either don’t start or don’t complete their full vaccination courses. Most vaccines have to be kept at low temperatures—between 2°C and 8°C—up to the time they are administered to the child. This is a considerable challenge in many places, like sub-Saharan Africa, where daytime temperatures can soar to 45°C or higher. In order to deliver the vaccines to all of the places they are needed, a ‘cold chain’ of refrigeration must be set up to control the temperatures at which the vaccines are kept. This is a very expensive and difficult operation, requiring a stable electricity supply to power refrigerators. If the system fails, and the vaccines either overheat or freeze, they become unusable. Countries often find it extremely challenging to support cold chain requirements in order to reach children in the farthest and most remote areas. MSF’s research arm, Epicentre, is currently carrying out studies in Chad on an existing tetanus vaccine to see if it can be kept out of the cold chain for longer periods of time without reducing its efficacy. The idea is that this would allow the vaccine to be transported in the cold chain to the district where the vaccine will be used, and then allow for less-rigid temperature control until the vaccine is administered. This would make it easier to vaccinate people especially in hard-to-reach places. If the study shows the vaccine is still effective, there is great potential to decrease the burdensome cold chain requirements. Vaccinating a child through traditional needle injection requires a trained health care worker, but many countries suffer from a severe lack of skilled staff. Easier ways to deliver vaccines will allow more lay volunteers to administer vaccines, vastly increasing the potential reach of vaccination services. Traditional needle injection also creates hazardous waste which must be disposed of properly, often a challenge in countries with limited waste disposal systems. Simpler and safer ways of administering vaccines are needed. Vaccines that can be given orally, or through micro-needles, or through inhalation or patches—just like nicotine patches to help smokers quit—could greatly extend the reach of immunization. A number of these technologies already exist or will soon be available. For example, a measles vaccine is being developed that could be inhaled. But more efforts must be made to push these products forward and make them available on a large scale to people in developing countries. Vaccine adaptation is also a question of epidemiology. Some vaccines may not be very effective because they don’t target the specific strain of a disease circulating in a country. Rotavirus disease, for instance, is a big killer of children in Africa, however the available vaccines, developed for use in Europe and the US, don’t give as much protection to children in Africa as they do in richer countries. Among several reasons for this lack of efficacy could be that the existing vaccines were developed to target strains of the disease that are most prevalent in industrialized countries. MSF’s research arm, Epicentre, has carried out a field study on the main strains or genotypes of rotavirus disease currently circulating in Niger. While the data confirms that rotavirus is an important cause of severe diarrhea in Africa, it shows that the most common rotavirus genotypes documented in the study are not included in the two existing vaccines that aim to prevent the disease. In addition to the cold chain requirements of the vaccine and their volume, this mismatch shows how vaccines are mainly developed for industrialized countries and then used in Africa and Asia at a later stage, whether they’re adapted to those contexts or not. This points to the need to consider the specific needs of developing countries into vaccine research and development from the very start of the process. 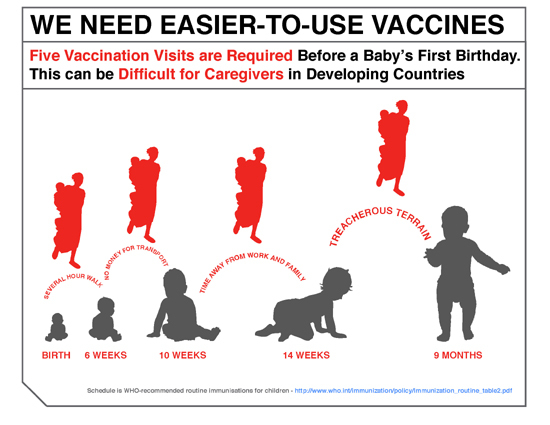 When countries are unable to ensure that children are protected by even the most standard package of vaccinations, there needs to be more effort put into getting the basics straight as newer and more expensive vaccines are added. While the newer vaccines could help save many more lives, they won’t be delivered to the children who need them if the basic national immunization structures aren’t sufficiently functioning. There is plenty of evidence that many national immunization programs are not getting adequate support. For instance, measles is preventable with an affordable vaccine, but the last few years have seen increasingly frequent outbreaks of the disease as basic immunization programs are neglected in some places. After a few years in which the numbers of children dying from measles declined, the trend is now once again upwards. In 2010, during several outbreaks in the Democratic Republic of Congo alone, MSF administered four million measles vaccinations in a bid to control the spread of the disease. Rushing out new vaccines that are not tailored to developing country settings can only deliver partial success. Simplifying and adapting existing and new vaccines to the needs of target populations is key. Only by doing so will we be able to reach one out of every five children that is unprotected from childhood killers and deliver on international commitments to offer the benefits of immunization to all. 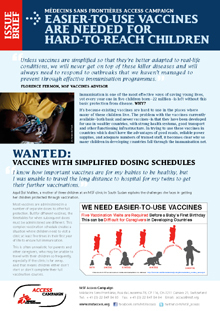 To make sure that vaccines reach as many children as possible, there is an urgent need for better-adapted vaccines that are more thermo-stable and less bulky, that can be given without the use of needles, that require fewer doses and have more flexible dosing schedules, and that are tailored to the epidemiology of the countries that are disproportionally affected by those diseases. The global vaccine community should do more to ensure that developing better-adapted vaccines is part of the wider strategy to increase coverage, so that many more children can be protected. The GAVI Alliance should support development of more appropriate vaccines for its eligible countries and use its purchasing power to incentivize more research and development in this area. Epidemiologic surveillance of vaccine-preventable diseases should be improved to tailor development of vaccines more effectively. Governments of developing countries should set priorities and feed information needed for suitable product development to vaccine developers. The World Health Organization should increase investment into operational research in developing countries to see how to improve the delivery of vaccines. Each year, MSF teams vaccinate over ten million people, primarily as outbreak response to diseases such as measles, meningitis, diphtheria, pertussis, and yellow fever. MSF also supports routine immunization activities in some projects where we provide health care to mothers and children.